It's only natural that conflict will sometimes occur in the workplace. In his definitive textbook, Managing Conflict in Organizations, M. Afzalur Rahim points out that "intergroup conflict is inevitable in complex organizations." Further, as the University of Oregon's Holden Leadership Center points out, "conflict is inevitable in any interpersonal relationship." What determines whether or not conflict will have a negative or positive result lies with how it is managed. An important key to learning how to manage conflict effectively lies with recognizing that there is not just one right way to deal with conflict. 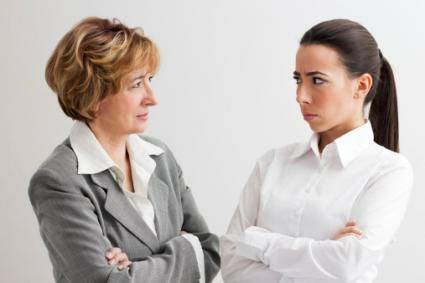 There are five approaches to conflict management, and those who are skilled at dealing with conflict are able to select the technique(s) that work best for the particular situation they are facing rather than sticking with the approach they are most comfortable with all the time. When deciding what approach to use, you must consider the people involved, the culture of your organization, your ultimate goal(s) and the nature of the specific issue of concern. The avoidance strategy involves staying away from conflict instead of addressing the issue. Avoidance may manifest as withdrawing or backing down when confronted, changing the subject or sidestepping the issue, pretending like something isn't bothering you or that there isn't really a problem, putting off dealing with things, or physically removing yourself from the situation by walking away or maybe even quitting your job. While avoiding a conflict won't help solve the point of disagreement, there are some times when it is the best course of action. The issue is one that is so trivial there is no point in putting time and energy into dealing with it. The potential for disruption or damage to the relationship is more significant than the benefits of resolving the conflict. The cost of 'winning' may, over the long term, outweigh any short term benefit of reaching a resolution. You need time to think through the situation before moving forward with a resolution. There is insufficient time to deal with the issue at a particular point in time. There may be more pressing issues at the immediate time, such as in an emergency situation. The time and place may be inappropriate, such as when customers are around or you are in a public area. Someone else is better suited to deal with the conflict, so you decide to wait until that individual is available. You are absolutely certain there is no way your concerns will be met. The problem will not get solved this way. This can lead to a loss of self-respect. You could become even more frustrated. The problem will likely continue to get worse until it gets better. The relationship between the people who are having conflict can become damaged. As a conflict management strategy, accommodation involves a degree of self-sacrifice through 'giving-in'. One person gives up his or her own concerns so that the concerns of the other person can be met. This is often done for the purpose of 'keeping the peace' or maintaining harmony. While accommodating isn't an appropriate approach in all situations, there are sometimes that it is a good course of action. The issue is trivial and the outcome really doesn't matter. Harmony is actually more important than resolving the situation that is in conflict. Your long-term objective is more important than winning, such as dealing with a difficult customer in order to close a sale. It's important to let the other person learn from his or her own mistakes. You realize that you are wrong. You want to minimize hard feelings in situations that you are not going to win. As a conflict management strategy, competition is a win-lose approach in which conflict is viewed as a struggle. It assumes that the only way that you can get your goals is to 'win' while the other person (or people) involved must lose. When you use this approach, the focus is on pursuing your goals at the expense of others. This approach is appropriate in a few specific situations, but can permanently damage relationships if used too often or in the wrong types of situations. A quick, decisive action is required, such as in an emergency situation. You are certain that you are correct. You need to stand up for yourself against a pushy person who is trying to take advantage of you. You need to assert your authority (though you should do this only if you have actual authority). Your goal is to foster teamwork and cooperation. The person you are in conflict with has formal power and the decision-making authority that goes along with it, and you do not. Collaboration is a win-win approach to conflict management. It is based on the belief that it really is possible to come up with a solution that will satisfy the concerns and meet the needs of everyone involved. During attempts to manage conflict using this approach, the focus is on working honestly and openly with the other person to come up with a solution that meets the underlying concerns of all parties. While this type of win-win solution is possible in some situations, that is not always the case. When you start out with this approach, it's important to be prepared to change strategies if it becomes apparent that the strategy will not be successful. The concerns of everyone involved are of utmost importance. There is a high degree of trust among everyone involved in the conflict. It's important to preserve a positive, long-term relationship between those who are in conflict. It is really important for everyone involved to be fully committed to the outcome. One person does not want - or should not have - full responsibility for the final decision. There is a need for the people involved to work through animosity. Everyone involved is willing to take a collaborative approach without advancing their own agendas. Encourages people involved in conflicts to exhibit real teamwork and cooperation. It can lead to better relationships between the people who are in conflict with each other. It doesn't lead to situations where someone is the winner and someone is the loser. Sometimes it is just not possible to come up with a solution that will fully satisfy the needs of everyone who is involved. Many workplace conflicts are best handled by compromise. This approach involves elements of collaboration, in that those who are involved in the decision must reach an agreement on the decision. However, it does not have the win-win element of collaboration. Instead, compromising involves an element of accommodation, in that everyone who is involved gives up part of what they want and an element of competition, in that everyone gets part of what they want. The end result is a workable solution that partially meets the needs of everyone who is involved. The result is a workable solution. The people involved in the conflict will at least be partially satisfied. There is a need for all parties to give up something. If you don't try to collaborate first, there is a chance that a better solution might be overlooked. If your company wants to really focus on helping employees learn how to best manage conflict, the Thomas-Kilmann Conflict Mode Instrument can be an effective assessment tool to help people determine if they are over-using one of the approaches to conflict management, which is a great starting point for making positive changes. The online version of the instrument costs $40 per person, or you can order paper versions for between $30 and $40 per employee, depending on the quantity ordered.